Per my suggestion for artists to get dirty in 2014, I can look no further to the complicit and dirty exhibit in Dallas at the Nasher Sculpture Center this week to prove my point of getting dirty. The entire exhibit is based on the clay works of major artists – nothing is more primal than clay. Clay is the cheapest, basic, most common and dirty material. It’s also very sexual – it’s warm, smooth and slithery when wet, and the more you touch it the warmer it gets. Ceramics has a lineage of humans trying to make the most ordinary beautiful, and proves the innate human urge to decorate. The exhibit at the Nasher Center is centered on the ceramic arts of some of the foremost artists of contemporary art history. Ceramic arts is much like airing ones’ dirty laundry – ceramics have been the most excluded and ignored arts medium over the past 300 hundred years or so of “fine art”. Here at the sculpture center lies anomalies to the times, anomalies to the artists’ represented oeuvres, and most definitely anomalies to contemporary arts’ appreciation. 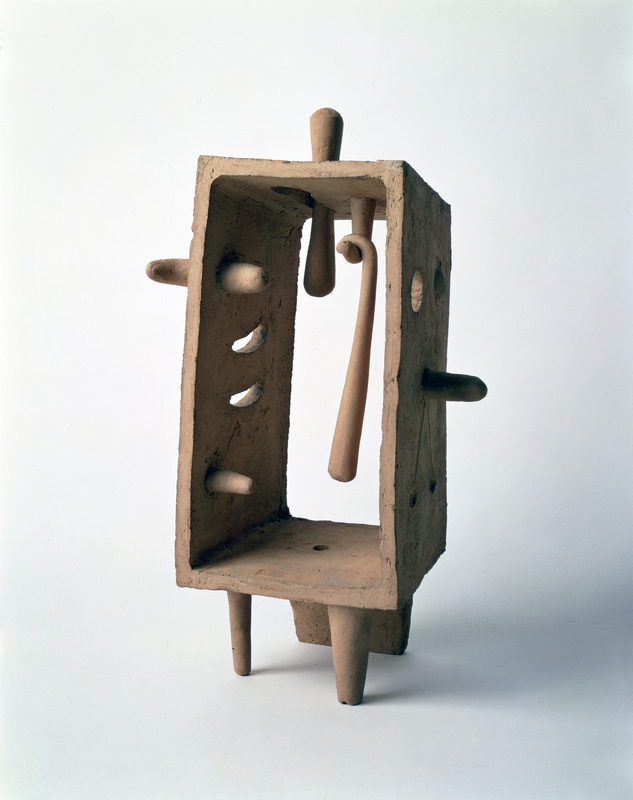 So here you have in a room – Lucio Fontana, Fausto Melotti, Joan Miró, Isamu Noguchi, and Pablo Picasso – but not their razzle dazzle paintings, not their heavier than though stone sculptures, but their intimate and humble ceramic works. One must not look further than Lucio Fontana to understand the complete removal of the expected and anticipated – he who made the most antiseptic art in his late career (concetto spaziale, or spacial concepts), had the messiest and most figurative ceramics of the bunch in this Dallas show. Are the ceramic bits of an artist’s oevre the dirty or most obvious secrets? Before I suggest so on the more substantial artists in history, I will admit that my very first dabble in ceramics proved the juice to push me over the edge into a full blown art major. After taking a drawing class (and sitting for hours without noticing time elapse while drawing), I took a ceramics class that whirled me from Raku pottery to making a self portrait out of ceramics. The self portrait was outlandish! I fault the medium of ceramics to bring me to earth and make honest what I know about myself. And yes, the final self portrait resides proudly at my parent’s home – a confusing carousel of colors and characters making up a true to form merry-go-round. I believe that clay as art is humbling, it is demanding, and it requires you to make your vision as directly as you possibly can. 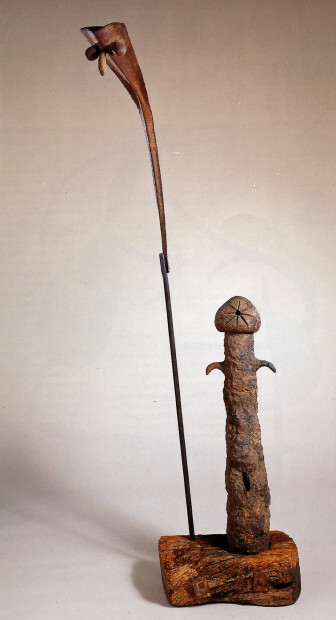 If I wasn’t as insecure as I was when I worked with clay over 20 years ago, I would hope to make a sculpture as obvious and profound as Joan Miró’s sculpture in the Dallas exhibit. (Home et Femme) – c’est parfait! Mon dieu! Returning to Fontana’s ceramic sculpture – it is comforting to see such figurative work, such expressionistic work from an artist that is perceived mostly for his later, more conceptual work. The pieces included in the Nasher exhibit suggest his roots in theater, in expression, and in passion. The later rips in his canvas are not a far extension of this thought, only more subtle. The ripped canvases were often accompanied by an extravagant setting, or back drop that Fontana devised – he was always considerate of the place and space (the theater) where his work would preside. Though his earlier ceramic work seem to describe his past: his father was a figurative sculptor, and while Argentinian he lived in Italy with a history steeped in il teatro. While this exhibit is historical, its presence is felt today. If not in my admonition for artists to get dirty, than you may look to the capitalist, Gagosian who held a significant show of a ceramicist this past Fall. A beautiful, quiet showing in an otherwise unearthly setting of Edward Du Waal’s work, whose recent book The Hare with the Amber Eye is equally as compelling. 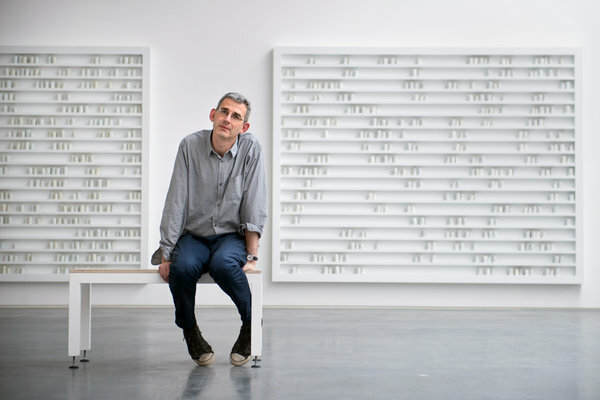 Edmund de Waal in his studio in London. An exhibition of his porcelains will open on Sept. 12 in New York. Photo courtesy of Andrew Testa for the NY Times. While I cannot visit the Dallas art exhibit, I am fully enthused and re-inspired with the thoughts of revisiting clay as a valid form of expression and accidental truth in being. PS. Please note size of “humble” ceramic pieces – the Fontana “Harlequin” is almost 3 feet (a full meter)!